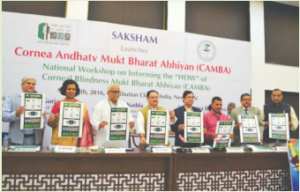 ‘CAMBA’ stands for Cornea Andhatv Mukta Bharat Abhiyan (in Hindi). It means Corneal Blindness Free Bharat Movement (in English). be accomplished with the networking by Sight Keepers (Netra Rakshak) at grass root level. 2. To network with existing Eye Banks and to start Eye Collection Centers. 3. To seek the support of Cornea specialists, Eye specialists and Optometrists and to network them in the covered area. 4. To propagate the need of Eye Donation through intense awareness amongst public. To take efforts for improvement in the infrastructure for Eye Donation in the country. 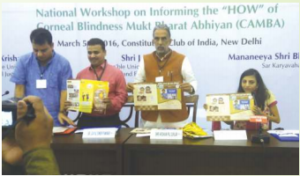 National Workshop on Corneal Blindness was organized to launch ‘CORNEA ANDHATV MUKT BHARAT ABHIYAN (CAMBA)’, on 05.03.2016, at Constitution Club, New Delhi. 42 Eye specialists, Directors of Eye Banks, President and Secretaries of SAKSHAM’s 29 prant units were present in the workshop. The presence of the following dignitaries glorified the magnitude and gravity of the Abhiyan. Ms Ira Singhal, First IAS topper with disability.